Kaare Andrews’ Iron Fist: The Living Weapon was a controversial book for the character — unlike in previous incarnations (like in Brubaker and Fraction’s Immortal Iron Fist), Andrews’ Danny Rand was not a lovable goofball, but someone who was filled with angst and rage (he narrates a lot about “choosing death” in the first issue). Some people who read the book loved it, but some people hated it. So when a follow-up written by Andrews and illustrated by Afu Chan called Iron Fists was announced, there were some who were excited and a lot who weren’t. However, the announcement of the book (for 2016's Marvel NOW) came and went and the book never appeared. Instead, Iron Fist by Ed Brisson and Mike Perkins came out in 2017...and yet, Kaare Andrews said that he was still working on Iron Fists. It turns out that, as announced at San Diego Comic-Con today, the renamed Immortal Iron Fists would actually come out as a digital-first book, put out as part of the partnership between Marvel and Comixology. Well, the first issue came out today as well and, while it wasn’t great, it was promising, if a bit shaky. 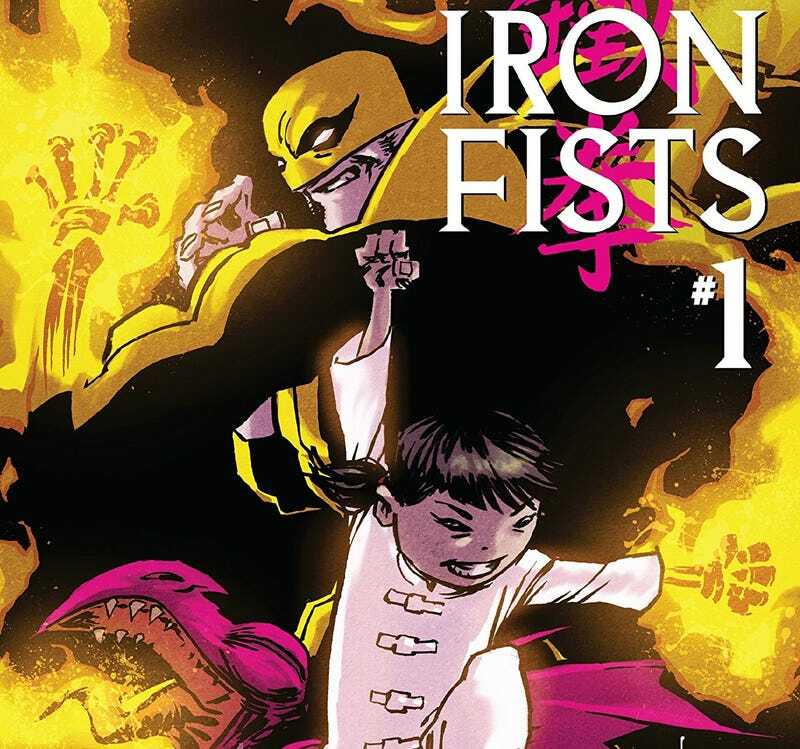 The main character of the book is actually Pei, a young girl introduced back in the first issue of Andrews’ Iron Fist: The Living Weapon. Pei is, in fact, the youngest person in K’un L’un to ever be marked by Shao-Lao the Undying and be granted the Iron Fist, so Danny has taken her under his wing and is trying to teach her not only to be a weapon, but also a person. And yes, the art is kind of weird looking (especially Danny’s face, oh god), but Afu Chan (who has done the weird fantasy Spera and the cyberpunkish Halogen) does a lot of really interesting stuff as well, making a lot of the pages more dynamic. Danny, in trying to train Pei, has also enrolled her in public school and instructed her not to get into fights (since she is, you know, a living weapon and all that). Which is more difficult than it seems, as she seems to go to “Cliche High School with Cliche Bullies.” Meanwhile, Danny himself is having trouble as well, considering he is a crimefighter, billionaire, superhero, and Defender, so he doesn’t have a lot of time on his hands. In any case, Danny ends up hiring someone to help around the place and while at first Pei thinks this is because she is doing a bad job, it turns out that Madame Yeoh is just the right person to help Pei figure things out. Honestly, Pei’s story is the best thing about this issue. When the issue moves on to Danny and a cop friend investigating into some supernatural cannibalism, that’s when the issue kind of falls down — we’ve seen all that before and juxtaposing it with a masked Pei fighting against bullies just jumbles the story, since neither scene is reflecting the other. So the book is off to a shaky, but promising start. The artwork takes some getting used to, but once you do, it really helps the story along (especially in fight scenes or with Gork). As long as Andrews’ focuses on the trials and tribulations of Pei and leaves Danny in the background, I think this book could be absolutely great.